Here are five things I had to unlearn from high school. School taught me that anyone who is different than you should be looked down upon. My mother taught me that all people have worth and should be treated with respect. I consider myself lucky to have an attitude from home that counteracted what I was being taught in school. Even teachers partake in the shaming and bullying of the “different” kids. If you made people uncomfortable because you weren’t exactly like them, you were treated as the lesser class. Learning to write academically really messed with my ability to write creatively. The more I have grown as a writer, the more I have had to unlearn most of what I was taught in school about grammar. Most writers and journalists will tell you, grammar “rules” are more like guidelines, and most are completely arbitrary. Unless your reader is another grammar Nazi created by public school, they aren’t going to care whether you use a comma or a semi-colon. Writing is more about allowing words to flow; creating an experience that your reader will remember. They don’t teach you that in school. In school you are taught that your emotions, curiosities, and other interests should all be put on hold in order to focus on the subjects laid out for you. Any interest you were acquiring in history class should be immediately shut down in time for science class. Interests that you have at home don’t belong in school. And going off on side trails that deviate from the perfectly planned curriculum are unacceptable. I learned to operate on what they thought “should” be important to me, instead of what truly was important to me. I have had to re-learn that side trails and fringe curiosities are often the paths that take us on the explorations and learning experiences of a lifetime, that there are things in life that are more important than academics. As with any institution or government, schools wanted students to believe that breaking a rule, any rule, meant you were a bad person. Their lesson in this has worked quite well as a culturally held belief. Even the people that struggle the most with breaking the rules believe this about their fellow citizens. But life has taught me something that will get you expelled from school: that morals and good judgment cannot be contained in a rule book. When I was a young teen in school, I thought that the way I was living was the way life would always be. At the risk of sounding morbid, life in school was a depressing, consuming black hole. There were many times I thought: if this is real life, I don’t want to live. I am so stinkin’ happy to report that school is NOT the real world. School is an institution. Its rules and methods are developed to control a group of people, keep them on the same page, and manufacture results from them. Because most of them are there against their will, it seeks to manipulate children into believing that school is a requirement of life. I think we all feel like rebels when we discover that it is not. In the end, school taught me how to make myself look great on paper, but it taught me little to nothing about life. In many ways, it impaired me from life. 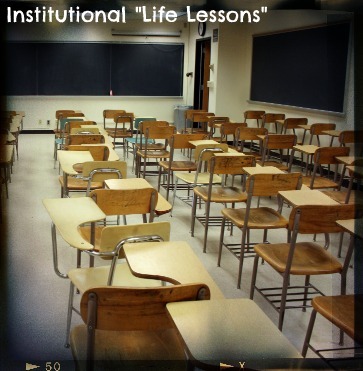 Through years of deschooling, I have been able to recover and unlearn some of the bad life lessons I learned in school. My name is Vanessa, and I am free from the institution.